If you’re into the supernatural, odds are, vampires and werewolves are your thing. You watch movies and TV shows based on vampires (Twilight and Buffy the Vampire Slayer) and you read books as well in the vein of Anne Rice and Cassandra Clare. With the popularity of the genre, it was only a matter of time that a skin care procedure would come out invoking the same images you love. Enter the vampire facial. Intrigued? As well you should be, which is the whole point in the name. MDPen, a professional microneedling company, explains below. The vampire facial (otherwise known as microneedling with PRP) is very similar to the vampire facelift, which surged in popularity when Kim Kardashian admitted she had used the non invasive cosmetic procedure. The vampire facelift uses a portion of your own blood to promote a boost in collagen production, which gives you a more youthful appearance. Known as PRP (platelet-rich plasma therapy), platelets in the blood are separated out and then injected into the treatment areas. Platelets are the components in the blood, which aid in blood clotting. They are known to stimulate cell growth as well. Both factors make platelets potent in promoting collagen production. The vampire facial is very similar. It targets the same cells in your skin to boost collagen production and uses the same PRP therapy. However, the difference is in the delivery method. A vampire facelift is injected into the skin along with a dermal filler. The vampire facial is used in conjunction with microneedling. First, a microneedling procedure is performed. Microneedling is a non invasive cosmetic procedure that creates tiny pinpricks in the skin using a microneedling pen. To the body, these are injuries. Thus, your skin reacts by boosting collagen and elastin production, which are the proteins in your skin that gives it structure and produces new, younger skin to replace the damaged skin. This is part of your body’s natural healing process. A microneedling procedure creates tiny micro channels from the pinpricks. Immediately after the microneedling procedure, your practitioner applies PRP therapy to the treatment area topically. This allows the PRP to reach the lower layers of your skin, which, in effect, gives you twice the healing power. WHAT’S THE DIFFERENCE BETWEEN A VAMPIRE FACIAL AND A VAMPIRE FACELIFT? Think of the connotation of their names to help you remember the difference between a vampire facial and a vampire facelift. A vampire facelift is more about shaping your face and its structure (like a regular facelift), while a vampire facial aims to improve the texture of your skin (like a facial). A vampire facial can improve pore size, help with acne scarring and pigmentation, and could be used to treat stretch marks — the same skin conditions microneedling targets as well. Important distinction: There are different types of vampire facials. The patented Vampire Facial® was designed and trademarked by Dr. Charles Runels of Alabama. 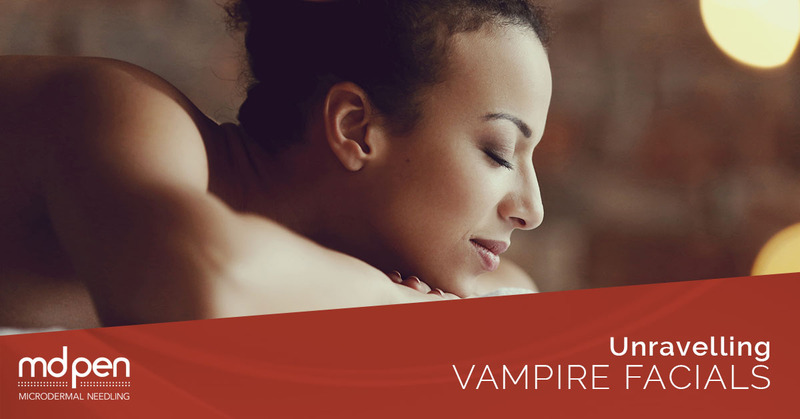 Practitioners who use the patented Vampire Facials® are specially trained by Runels’ team, use his techniques, and use his methods and tools. On his website, Runels states his goal is to standardize the procedure and control quality for the patient. This also gives the patient the best opportunity to obtain the results he or she desires. HOW LONG DOES IT TAKE FOR THE EFFECTS OF A VAMPIRE FACIAL TO SHOW? A vampire facial can take two to three months for the full effects of the non invasive cosmetic procedure to come to fruition. You’ll notice a healthy glow in the days afterwards while you wait for the collagen remodeling to be complete. This wait time is the same for a microneedling procedure as well as a vampire facelift. Dr. Runels says the effects can last up to two years before another round would be required, which is more than similar non surgical procedures. WHAT IS THE RECOVERY PROCESS OF A VAMPIRE FACIAL? The recovery time for a vampire facial is the same as a vampire facelift — about 24 hours. It is advises simply to avoid makeup for a day and strenuous exercise. You may experience swelling and bruising, but not for very long. WHAT’S THE AFTERCARE OF A VAMPIRE FACIAL? You don’t wash the PRP off your face for 24 hours to allow for maximum time to be absorbed by the skin. Then, in the days following, use common sense. Find a gentle skin cleanser and apply sunscreen to protect your skin from the sun. Using a high-quality hyaluronic acid serum to keep the skin moist and promote healing at minimum for the week immediately after your vampire facial is prudent. MDPen makes Pure Hyaluronic Acid Serum, which is specially formulated to aid in healing after a microneedling procedure. All natural and paraben-free, Pure Hyaluronic Acid Serum replenishes the skin’s moisture content, restores firmness and elasticity, and promotes healing. After one week following the procedure, return to your normal skin care routine. IS A VAMPIRE FACIAL FOR ME? Like all non surgical cosmetic procedures, it’s hard to say the effect a vampire facial will have on you. You will see improvement in acne scarring, stretch marks, wrinkles and fine lines, and sagging of the skin. However, we all have an idea of what we want to look like, and, like clothes shopping, until you try something, you just won’t know how it will fit and look on you. WHAT IS THE DIFFERENCE BETWEEN TRADITIONAL MICRONEEDLING AND A VAMPIRE FACIAL (MICRONEEDLING WITH PRP)? Traditional microneedling stops after the microneedling procedure. A vampire facial merely adds the step of applying the PRP to your face. A traditional microneedling procedure uses serums afterwards to speed the healing. By using platelet-rich plasma (PRP) directly after a microneedling procedure, you are healing the skin through the rich growth factors present in the PRP and in essence speeding the skin’s natural healing process. Microneedling with PRP can produce better results with fewer treatments due to the fact you are doing two treatments at the same time. Traditional microneedling takes about five to seven days of downtime because it takes longer for your micro channels to close and heal effectively. A vampire facial is usually reserved just for the skin on your face. A traditional microneedling procedure can be used to treat any skin conditions anywhere on the body, including your stomach, arms, legs, neck, and hands. If you don’t like needles, a traditional microneedling procedure may give you many of the same results as a vampire facial as both treat the same skin conditions. Consulting with a licenced microneedling practitioner who knows your skin care history is a good idea in order to make a decision. Skin care is a life-long practice. After all, your skin is your protective barrier from the elements of this world bent on invading your body. Its role should not be underestimated as it keeps us safe from viruses and bacteria, protects us from injury, and moderates our temperature. Our skin is vital to our health, and should be treated as such. MDPen believes in professional microneedling to help you gain the youthful appearance you desire, diminish acne scars and stretch marks, and help heal skin pigmentations. We offer micro needling training courses for doctors, nurses, aestheticians, and spa owners looking to add microneedling to their practice. We’ve spent countless hours developing our own proprietary skin care creams to be used in conjunction with microneedling procedures, which are vegan formulations, containing organic ingredients that are paraben, petrochemical and SLS/SLE free, and are never tested on animals. In our quest to support microneedling practitioners who bring this amazing, non invasive cosmetic procedure to thousands, we offer practitioner support. We sell microneedling pens, as well as microneedling brochures, numbing agents, and replacement heads for our microneedling pens. We offer financing on our microneedling pens in order to make it easier for practitioners to begin offering microneedling procedures. And we offer microneedling workshops for licensed practitioners, so they can gain hands-on experience, learn from experts in the field, and stay abreast of trends in the non invasive cosmetic procedure market. MDPen is passionate about helping people feel good about their appearance, which is so integral to how we feel about ourselves and how we interact in this world. Our goal through microneedling is to give you the self-confidence needed to wake up every day and slay dragons. Contact us today!